Jayandra Saraswathi had tried to break the hold of the Brahminical orthodoxy over the Kanchi math and make it more egalitarian. Jayandra Saraswathi, the senior pontiff of the Kanchi Kamakoti Math, who died Wednesday morning at the age of 83, was probably the most controversial among the heads of established maths in south India. He might be remembered outside Tamil Nadu as a math-head who was embroiled in a murder case. But that was not his only claim to fame (or infamy). He was a reformist who had tried to break the hold of the Brahminical orthodoxy over the math and make it more egalitarian, a move that almost proved to be his undoing. He even gave up his position as the pontiff of the math for a few days. Former Prime Minister P.V. Narasimha Rao, a devotee of the Kanchi math, even asked him to mediate with the Muslim community on the Ayodhya issue. Inducted into the math in 1954 at the age of 19 as the 69th pontiff, he was expected to follow the footsteps of his immediate senior pontiff Chandrashekarendra Saraswathi and other predecessors to conduct the math in the traditional Vedic style, concentrating on the Brahminical precepts. But the year 1980 changed everything for him. Meenakshipuram, a small village in Tirunelveli district of Tamil Nadu, hit the national headlines, when the entire population of the village converted to Islam. According to people who had been close to him during this period, Jayendra Saraswathi recognised the faultline in Hinduism that had triggered the conversions and embarked on an attempt to bring in Dalits and other socially oppressed classes into the mainstream Hindu fold. For months, he toured the state extensively, visiting villages, talking to Dalits and other communities. Departing from the usual convention of the math, which insisted that the pontiffs travel only by foot, Jayendra Saraswathi had got some of his devotees to donate a customised van (a precursor to all the political raths) that he used for his travel to these villages. 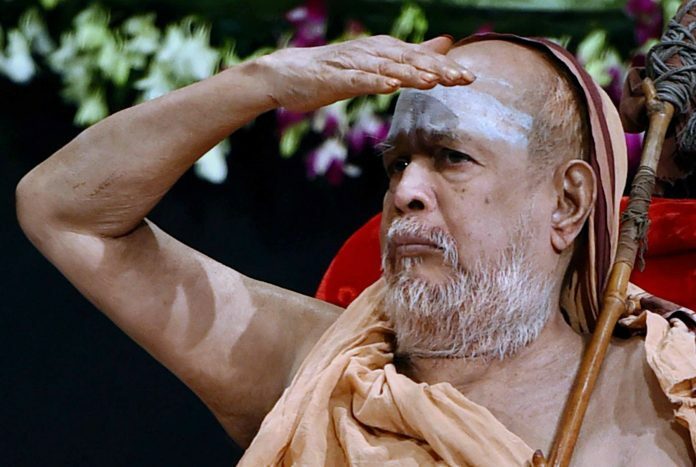 Though he was only the junior pontiff of the math, Jayendra Saraswathi became more high profile as the aging senior pontiff Chandrashekarendra Saraswathi was focusing energies on religious matters. He launched a social service movement called Jan Kalyan in mid-1980s, that took him and his band of younger devotees to the slums in and around Kanchipuram, later expanding it to other parts of Tamil Nadu. In an interview to me during this period, Jayendra had claimed that he was trying to promote Hindu spiritualism that was in consonance with social justice. He wanted to transform the math from being a smartha (saivaite Brahmin) math to a more universal one. But within the math there was quite an upheaval. The orthodox Brahmin community that controlled the math tried to put spokes in the wheels of the social reform he was attempting. The senior pontiff Chandrashekarendra too frowned upon his junior’s activities though he did not stop him. Vexed with this, in 1987, Jayendra disappeared from the Kanchi math, leaving behind his dhandam (staff) that signified his status as the pontiff, thereby symbolically declaring that he was renouncing the math. Those who had been close to him at that time said that he had even contemplated establishing his own math that would eschew the Brahminical orthodoxy. Three days later, he was located in Talacauvery (from where the river Cauvery originates) in Coorg district of Karnataka, and was persuaded, among others by former President and devotee R. Venkataraman to return to Kancheepuram and resume his position as the junior pontiff. But by then, Vijayendra Saraswathy, who had been inducted into the math a couple of years earlier, was anointed as the 70th pontiff. In 1994, after he had taken over as the head of the math following Chandrashekarendra Saraswathi’s death, Jayendra visited Delhi, Lucknow and Ayodhya/Faizabad, met leaders of both communities as well as political leaders. But he could not make much headway. In an interview during that time, he told me that he had come very close to a mediated settlement, but politicians were the stumbling block. According to him, neither the Congress nor the BJP wanted the issue to be settled. They wanted the issue kept alive for political gains. In 2004, he was named as an accused in the murder of Shankararaman, the manager of Varadaraja Perumal temple in Kancheepuram. Shankararaman had been involved in a campaign against Jayendra Saraswathi and his murder became a political issue, with the Dravida Munnetra Kazhagam (DMK) and the Dravida Kazhagam (DK) organising protests. On 11 November (on Diwali day) Jayendra was arrested and so was his junior pontiff Vijayendra Saraswathi on charges of being involved in the conspiracy. The arrest triggered a campaign against him and the math with a series of allegations of sexual wrongdoing also started coming up. Jayalalithaa, who was the chief minister at that time, seemed bent on “fixing’ Jayendra, so much so that the trial of the case had to be shifted to Puducherry. The case dented the image of the math and that of Jayendra Saraswathi, who till then had been seen as a spiritual reformer, and the neither of them fully recovered from the damage that had been wrought. The devotees of the math were divided with some stoutly standing behind him, and the others willing, at best , to give him the benefit of doubt. Even his acquittal in 2013 by the principal session judge in Puducherry could not fully restore the math to its glory. If you watch/read Black Friday you would see that even to arrest Bombay bomb blast pawns, Rakesh Maria saying to exercise caution since it was Ramzan. However, police arrest Kanchi Math pontiff in middle of night during Diwali without any fear. I say everyone is equal before law but for our law & order that is true only if you are majority. And when Mohan Bhagwat says Hindus must unite, there is a debate on it.